No one ever likes to think that an emergency could happen to them, but the reality is that disaster can strike anytime, anywhere. Even if you never need a family emergency plan, it’s best to be prepared with one just in case. Having a solid plan in place will give you everyday peace of mind, and, in the event of an emergency, could save lives. Depending on where you live, your area may be at risk for flooding, tornadoes, earthquakes, tsunamis or other emergencies. Every home and building experiences risk of fire, although some areas may also be more at risk for wildfires than others. Access local resources such as your city and state’s websites to discover what risks are most prevalent in your area. After you’ve identified the risks in your area, determine how you’ll be alerted about these risks. What emergency notifications are available in your area? Will you listen to the radio, will you get email or text alerts, or will you find out by watching TV? Sign up for emergency alert emails and/or texts so that you’ll have as much warning as possible in the event of an emergency alert or warning. 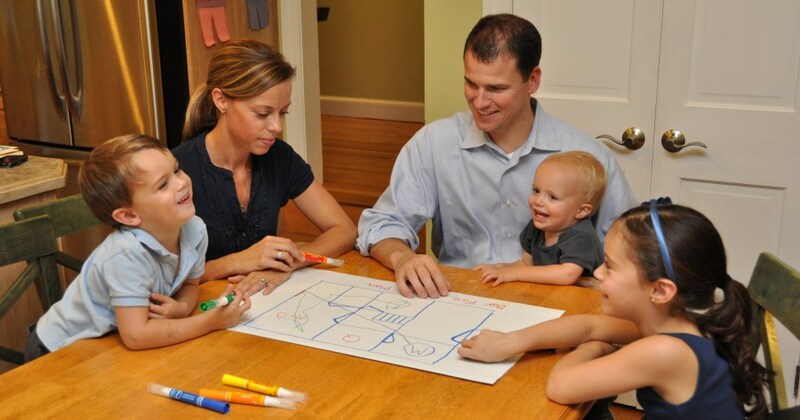 For each emergency situation, decide where the family will reconvene. In the event of a tornado, for example, decide where the family will find shelter within the home. Choose a room that’s on the lowest level of the home with as few windows as possible. In the event of a house fire, discuss how the family members can safely evacuate. Add details to the plan based on the needs of each family member. For example, who will be responsible for helping the youngest members evacuate or find their way to the safe room? If there are elderly or disabled family members, who will help them and how? You should also set up several meet-up locations or safe zones. One of the locations should be within your neighborhood. This is where you might go to all meet-up if there’s a house fire. Choose a nearby neighbor’s home or a landmark such as a big tree or mailbox. Then, set up a meet-up location outside your neighborhood. This could be the local library, a family friend or relative. This is where the family members can meet-up if you’re not together during the emergency and not able to return home. Finally, set up a meeting place outside of your town. This is where you can all meet-up if the family isn’t together and the community needs to evacuate. Choose a family friend’s home, a relative or a similar option. A copy of these addresses should be carried at all times by all family members. You can tuck it into your wallet, purse or briefcase and your children’s backpacks, just in case! 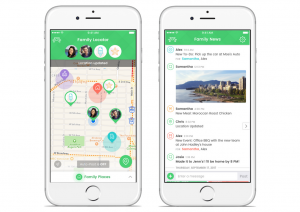 Use Picniic’s Family Locator feature to mark safe-zones and update family members when you’ve reached safely. Also with the ‘Auto-Post’ feature, parents can track movements of their kids to make sure they’re safe. During an emergency, communication is essential. This can help ensure that emergency personnel don’t have to go looking for a family member who is already safe. So, make sure each family member has a list of the contact information of all of the other family members. Include phone numbers and email addresses. If your children don’t have phones, include the contact information of their school or caregiver should you not be together at the time of an emergency. Also, include the contact person of one person outside of your immediate family. This person will be the contact point for all family members if communication between family members isn’t possible. Use Picniic, to constantly communicate with your family through the ‘Family News’ feature. In some disaster situations, basic first aid items, extra medication and a bit of food and water can save your life. The Red Cross offers a great list of items to include in your emergency kit. The kit should be easy to grab if you need to take it with you in case of an evacuation. Perhaps the most important part of your family emergency plan is putting it into practice. Especially when there are children in the home, practice will help make everyone’s response to an emergency automatic. Go over the protocol for how to respond to a house fire, what to do in an earthquake or a tornado, depending on what the risks are in your area. Don’t forget to go over what will happen if your children are at school when an emergency takes place. You might discuss who will pick your children up or how they can contact you. Remind your child to access the list of emergency contact numbers. It’s also a good idea to practice text messages or phone calls, especially with children. You might teach your child to text something very simple like “Safe. At School.” Remember, text messages might get through when a phone call won’t due to a saturated phone system. Looking for more information? There are plenty of resources available to help you create a solid emergency plan. The US government website, Ready is dedicated to helping families prepare for emergencies. The Red Cross also offers resources for how families can prepare for emergencies. Use Picniic to keep all of your emergency information in one place. With this family organizational app, you can also detail your emergency plans and update information as necessary. The info locker is the perfect place to store digital copies of important documents such as medical records. Not only can this be helpful to have on hand in an emergency, it’s an important backup feature should the documents be destroyed in a flood or fire. As you can see, Picniic offers many helpful features that can help you stay organized and prepared to handle any emergency that should arise. While no one likes to think an emergency will affect their family, it’s best to be prepared for the worst. That way, should an emergency event occur, your family can respond quickly and effectively.